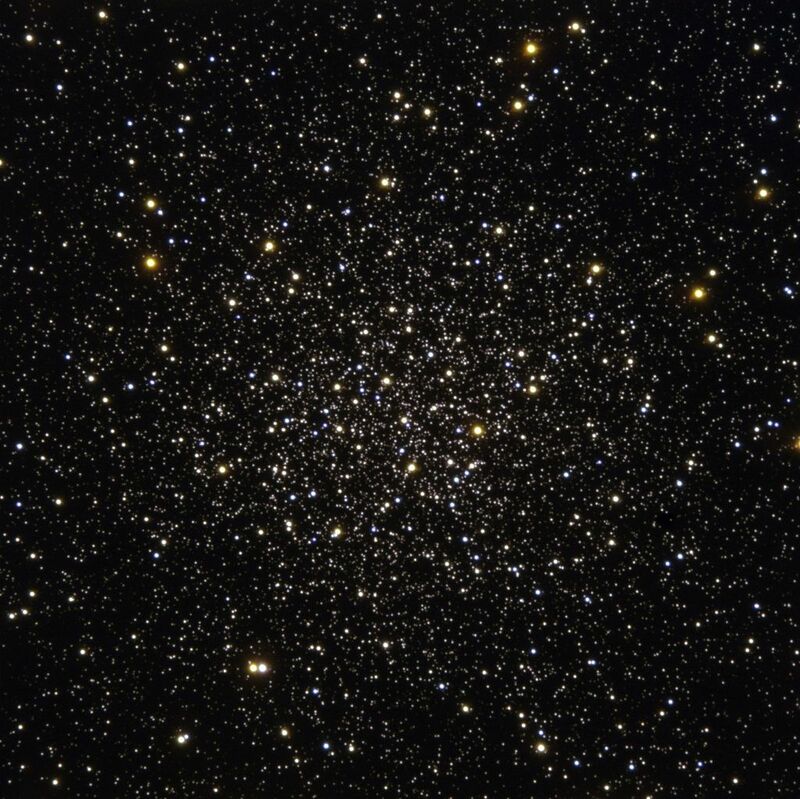 Messier 12 (M12), also known as the Gumball Globular, is a globular star cluster located in the constellation Ophiuchus. The Gumball Globular has an apparent magnitude of 7.68 and lies at a distance of 15,700 light years from Earth. It has the designation NGC 6218 in the New General Catalogue. Messier 12 is invisible to the naked eye, but can be seen with binoculars in good conditions, with clear dark skies and no light pollution. Stars in the cluster can be resolved with an 8-inch or larger telescope. A 10-inch instrument reveals the core with a diameter of 3 arc minutes and a halo of stars stretching across an area of 10 arc minutes. Messier 12 has a diameter of 75 light years and lies about 3 degrees in the sky from Messier 10, a slightly brighter globular cluster in Ophiuchus. M12 can be found 2 degrees north and 2 degrees west of Messier 10, 2 degrees north and 8.5 degrees east of the star Delta Ophiuchi, or 5.6 degrees from Lambda Ophiuchi. The cluster is approaching us at a velocity of 16 km/s. The Gumball Globular appears as a fuzzy ball of light in a small 3-inch telescope, while 8-inch instruments reveal the cluster’s brightest stars. Larger telescopes show stars across the entire area of the cluster. 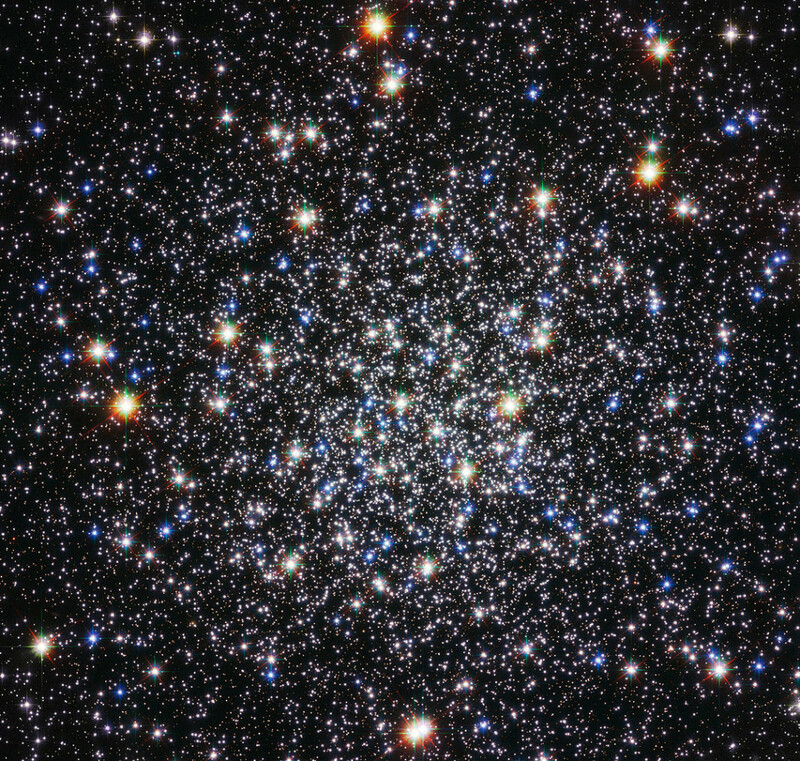 The high concentration of stars within globular clusters, like Messier 12, shown here in an image from the NASA/ESA Hubble Space Telescope, makes them beautiful photographic targets. But the cramped living quarters in these clusters also makes them home to exotic binary star systems where two stars are locked in tight orbits around each other and matter from one is gobbled up by its companion, releasing X-rays. It is thought that such X-ray binaries form from very close encounters between stars in crowded regions, such as globular clusters, and even though Messier 12 is fairly diffuse by globular cluster standards, such X-ray sources have been spotted there. Astronomers have also discovered that Messier 12 is home to far fewer low-mass stars than was previously expected. In a recent study, astronomers used the European Southern Observatory’s Very Large Telescope at Cerro Paranal, Chile, to measure the brightness and colours of more than 16 000 of the globular’s 200 000 stars. They speculate that nearly one million low-mass stars have been ripped away from Messier 12 as the globular has passed through the densest regions of the Milky Way during its orbit around the galactic centre. It seems that the serenity of this view of Messier 12 is misleading and the object has had a violent and disturbed past. Messier 12 has a Shapley-Sawyer classification of IX, which means that its member stars are concentrated relatively loosely toward the centre for a globular cluster. Compared to its neighbour Messier 10 (class VII), M12 is notably less dense toward the central region. In the same night of [May] 30 to 31, 1764, I have discovered a nebula in Serpens, between the arm & left side of Ophiuchus, according to the charts of Flamsteed: That nebula doesn’t contain any star; it is round, its diameter can be 3 minutes of arc, its light is faint; on sees it very well with an ordinary [non-achromatic] refractor of 3 feet [FL]. I have determined its position, by comparing with the star Delta Ophiuchi; its right ascension has been concluded at 248d 42′ 10″, & its declination at 1d 30′ 28″ south. I have marked it in the chart of the apparent path of the Comet which I have observed last year [the comet of 1769]. 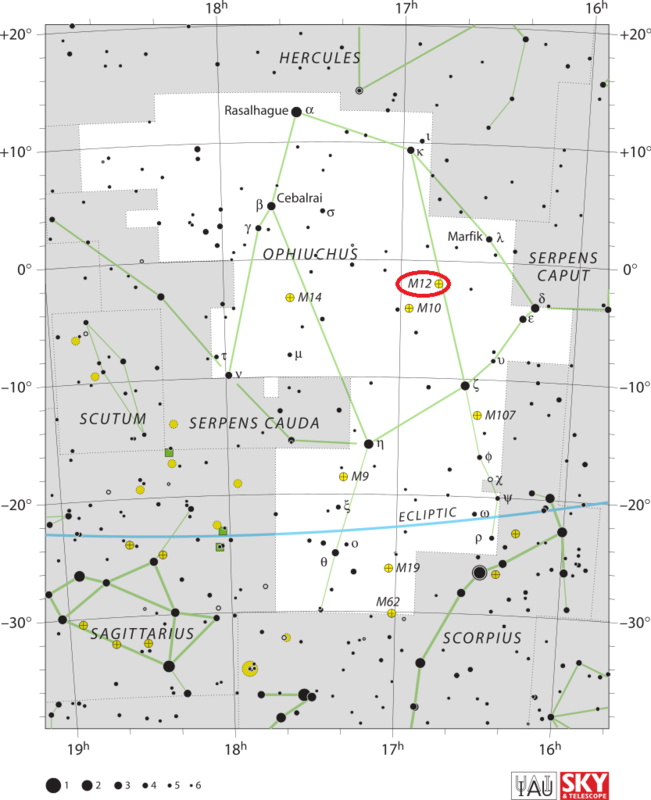 On August 14, I discovered in Ophiuchus two new nebulae [M10 and M12] not far from each other. One of them is situated south of 14, 16, 19 and 21 Oph near the western arm, the other below this one and eastward, closely west of 30 Oph. These nebulae appear very pale, and because of this, I found not very reliably the separation to Lambda as 6deg 7′, to the star 14 as 3deg 50′, and to 21 as 3deg 32′. The other one is separated from the 21st star by 5deg 32′, and by 1deg 4′ from the 30th, as shown in the second figure. A fine rich globular cluster, between the right hip and the elbow of Ophiuchus, with a cortège of bright stars, and many minute straggling outliers. This resolvable mass is greatly condensed towards the centre, with several very bright spots; it was discovered by Messier in 1764, but, probably from the imperfection of his means, was registered as “a round nebula, unaccompanied by any star.” Its place was obtained by differentiating with Epsilon Ophiuchi, from which it is 8deg 1/2 distant, on a north-west-by-west line, leading nearly upon Beta. Sir William Herschel resolved this object in 1783; and in the folowing year his 20-foot reflector made it “a brilliant cluster, 7′ or 8′ in diameter; the most compressed parts about 2′.” By the gauging process, he held its profundity to be of the 186th order. The Gumball Globular contains about 200,000 stars. The brightest ones are of 12th magnitude and the mean visual magnitude of the 25 brightest stars in M12 is 13.97. American astronomer Allan Sandage found 13 variable stars in the cluster. In 2006, M12 was discovered to contain a surprisingly low number of low mass stars. Scientists believe that these stars were stripped from M12 by the gravitational pull of the Milky Way Galaxy and that the cluster lost four times as many members as it still has over its lifetime. In other words, as the cluster’s orbit took it through the denser regions of the Milky Way plane, M12 ejected about a million stars into the galaxy’s halo. This explains why there are hardly any M-class (red) dwarfs in the cluster. It will take another 4.5 billion years before M12 dissociates completely. 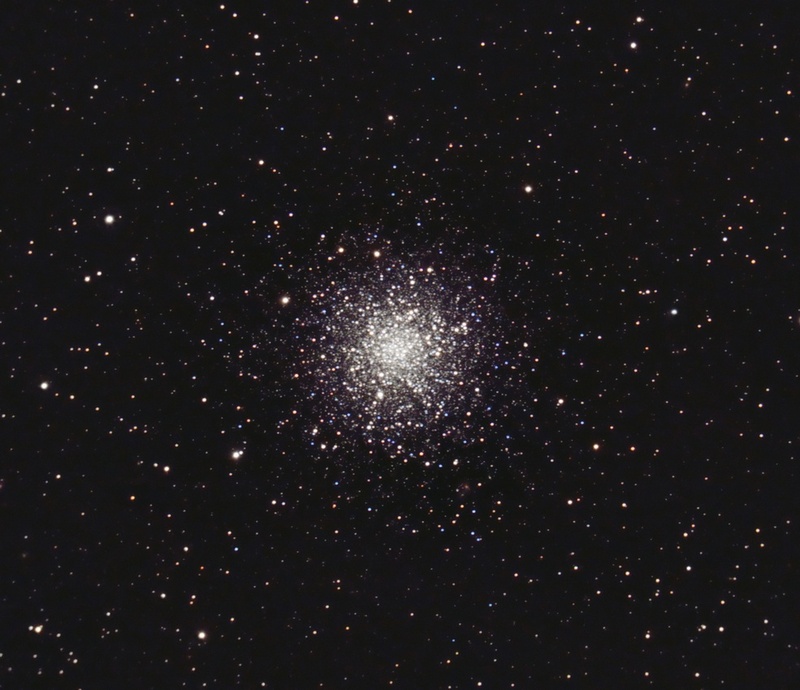 Messier 12 is best seen in the months of May, June and July.